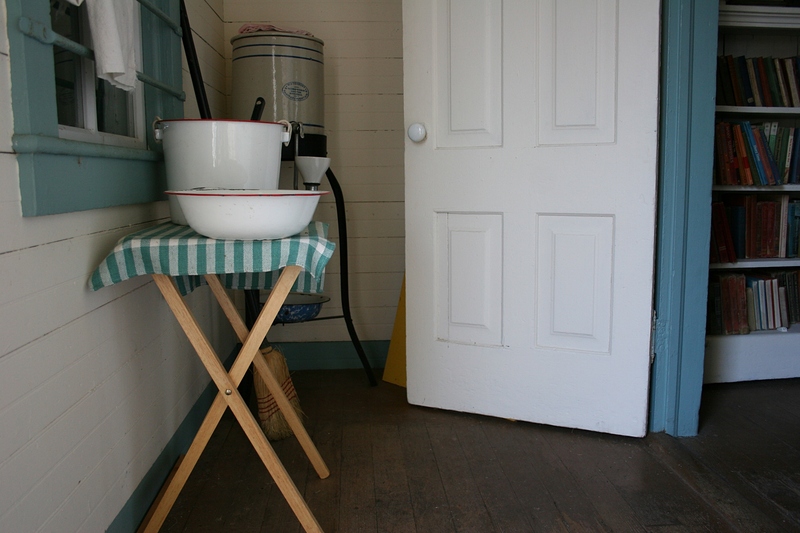 Wash basin and water cooler inside the schoolhouse entry. Harsh clang of the bell summons students inside the one-room Pleasant Valley School—girls to the left, boys to the right. Youth role-play Pleasant Valley School students. 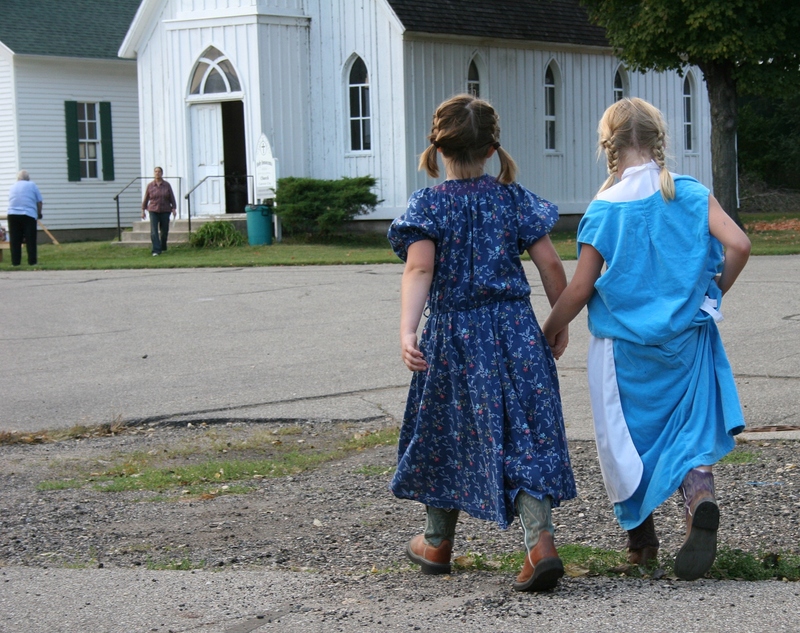 Girls in prairie dresses scratch chalk across slate. 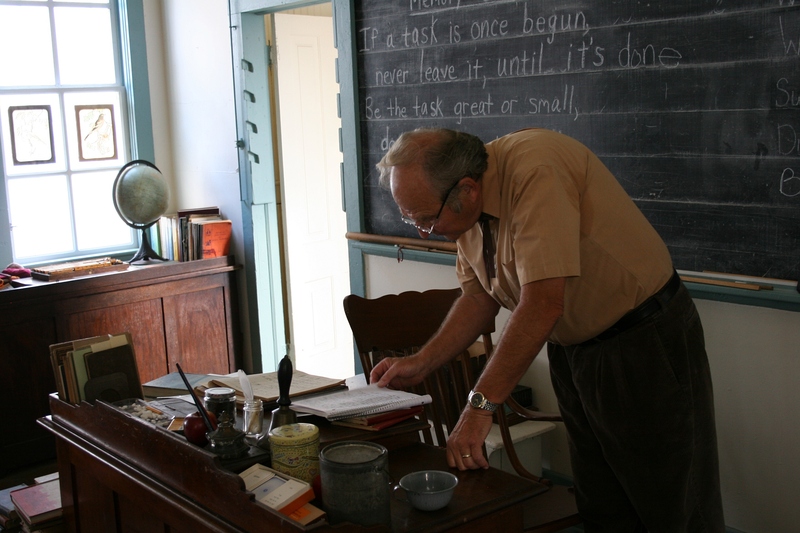 My friend Duane role-plays the Pleasant Valley teacher. Kids loved trying to walk on stilts. Outside, during recess, legs fly in a game of tag while others flail in attempts to walk on stilts. 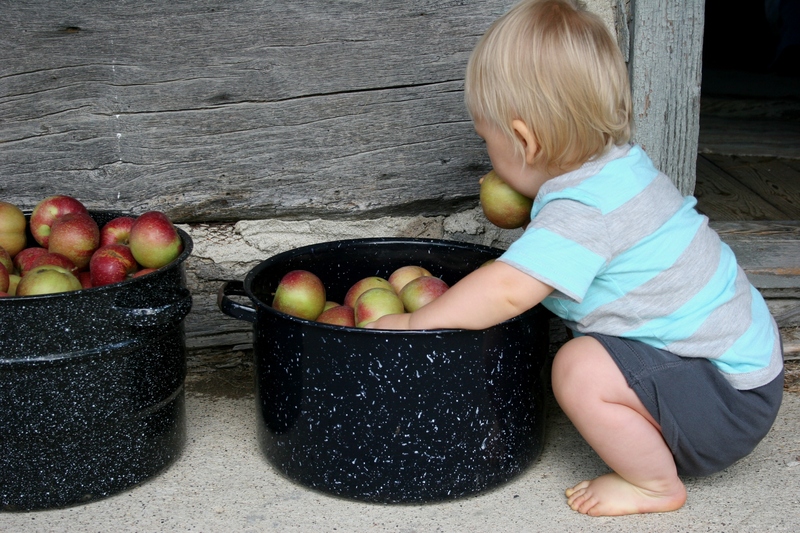 Luke, 13 months, finds an apple outside the log cabin. Across the way, in an 1856 log cabin, the scent of baking bread lingers while a steady hand cranks a butter churn. 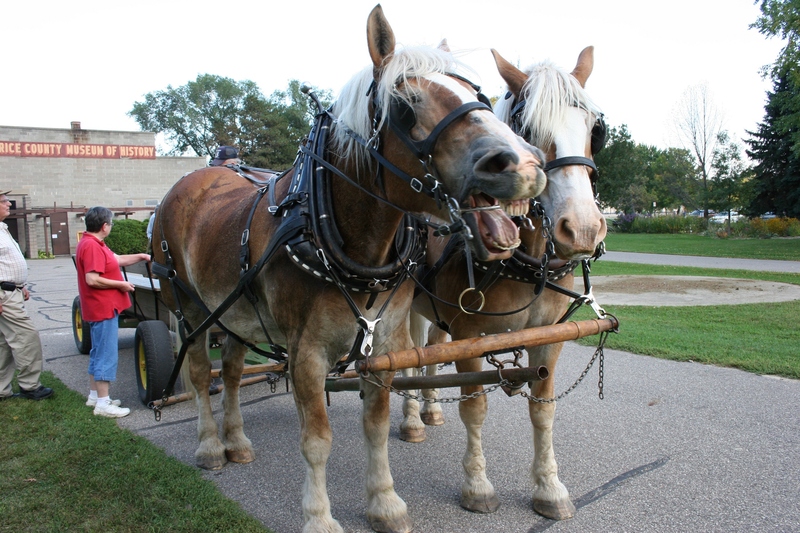 Mike and Pat bring their horses and wagon to many area events. 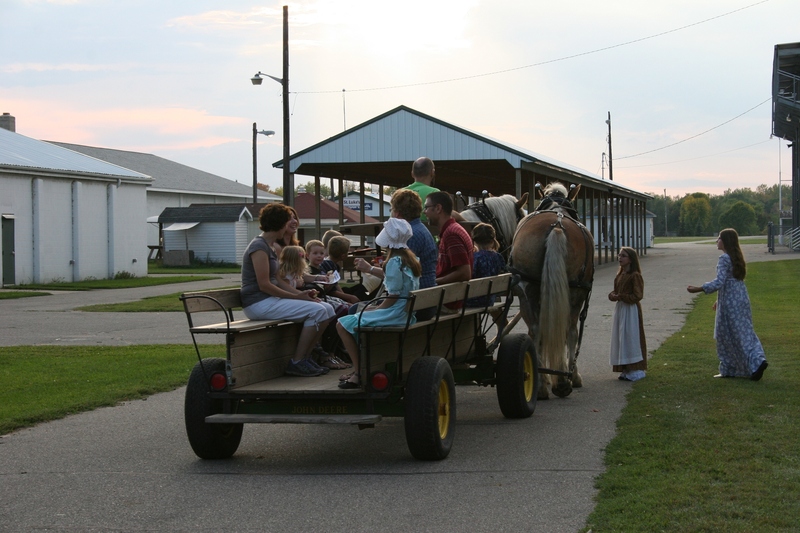 Wagon rides around the Rice County Fairgrounds proved popular. A team of Belgian horses pulls a wagon, not a covered wagon like Pa Ingalls’, but still, a welcome mode of transportation on a stunning autumn afternoon and evening in southeastern Minnesota. 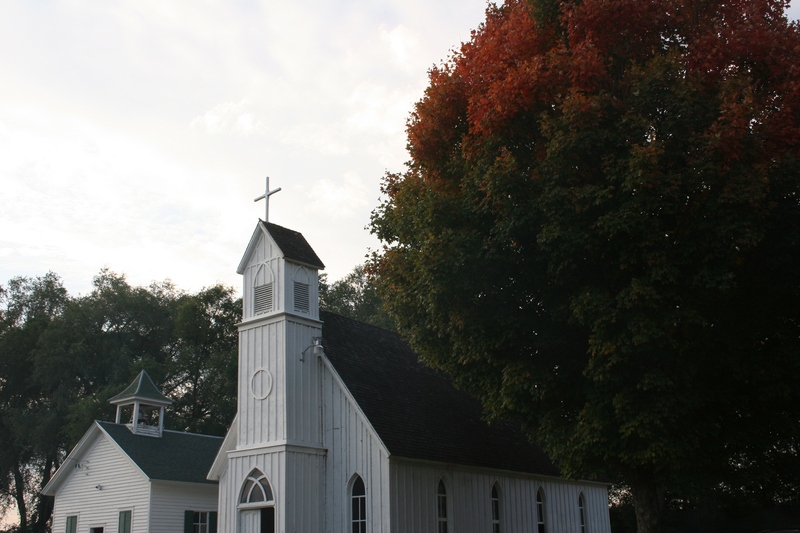 Pleasant Valley School, left, and Holy Innocents Episcopal Church at the Rice County Historical Society, Faribault, Minnesota. Fast forward to July 15, 1944, and Helen Greenville walks the worn floorboards of Holy Innocents Episcopal Church as she prepares for her daughter, Lilas’, wedding. “Oh the Deep, Deep Love” slides from bow to violin strings. 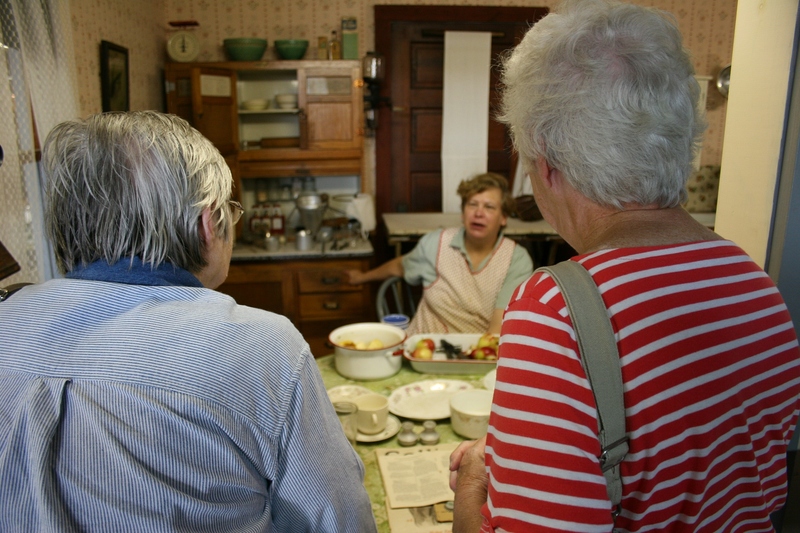 Visitors chat with Mrs. Morris, who is peeling apples in her kitchen. Next door, Mrs. Morris peels apples for applesauce. 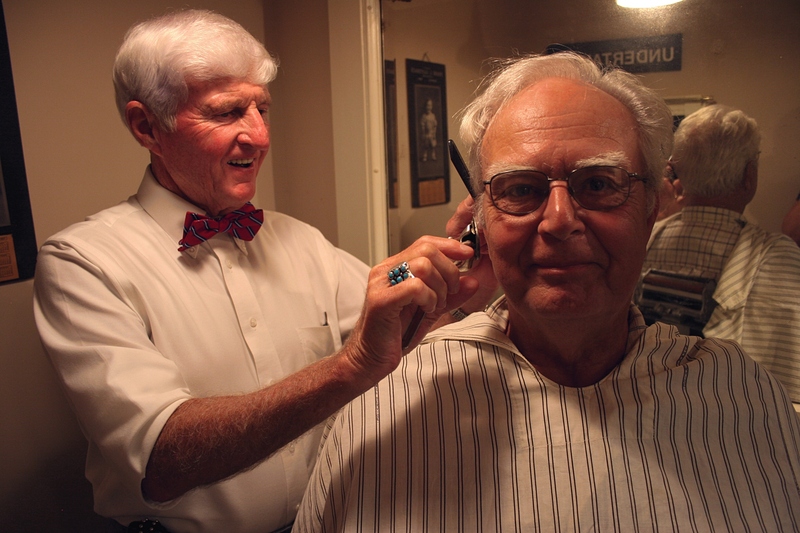 Barber Tom with customer LeRoy inside the museum barbershop. In another building, Hopalong Tenacity taps out Morse Code and the barber razors hair and Civil War veteran and businessman John Hutchinson greets guests, all dapper in top hat and tails. 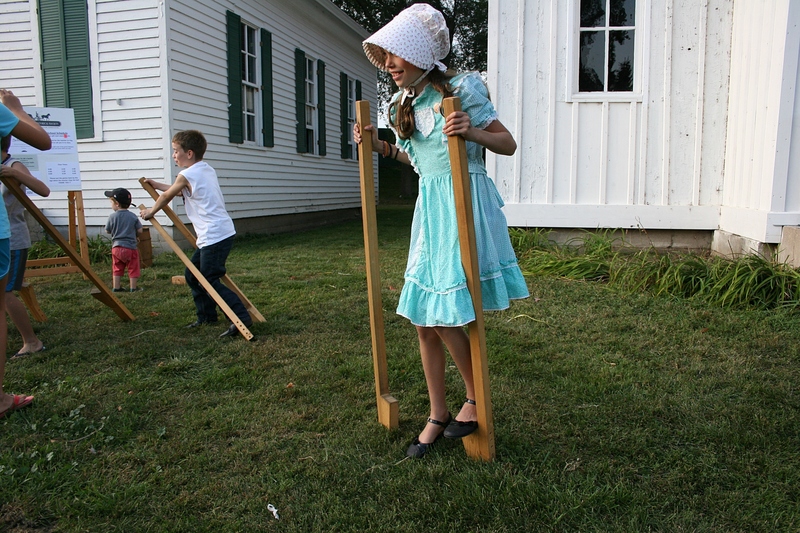 These scenes and more were part of the Rice County Historical Society’s second annual Night at the Museum, an event which brings history to life inside and outside museum buildings. 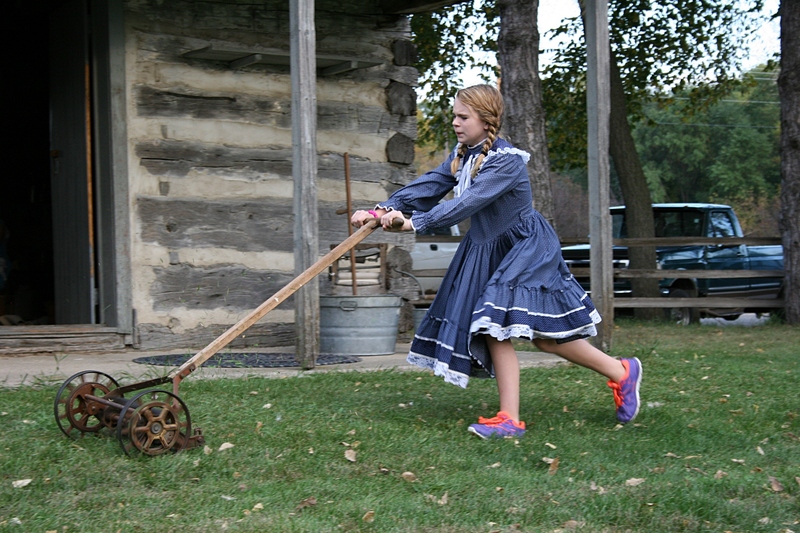 Kaylee, role-playing Katie, struggles to push an old-fashioned lawnmower across the lawn outside the log cabin. I loved it. 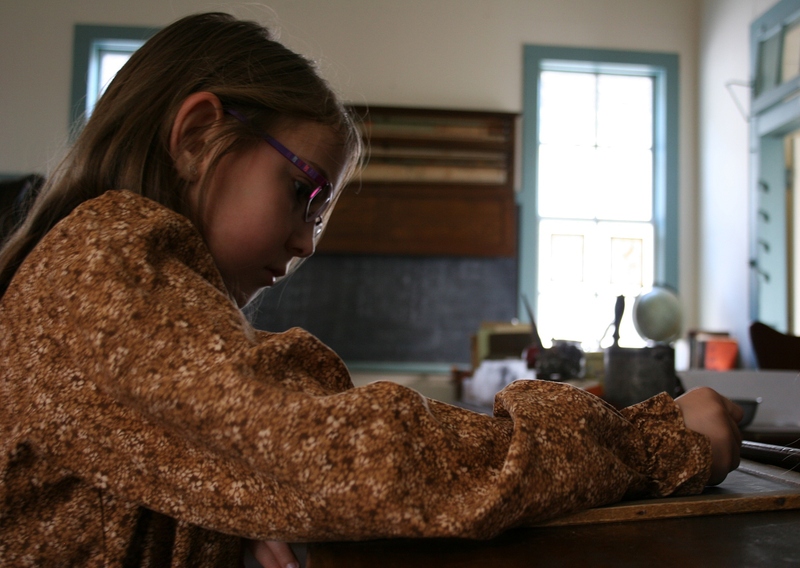 This is how I learn history best—through voices and stories and action. 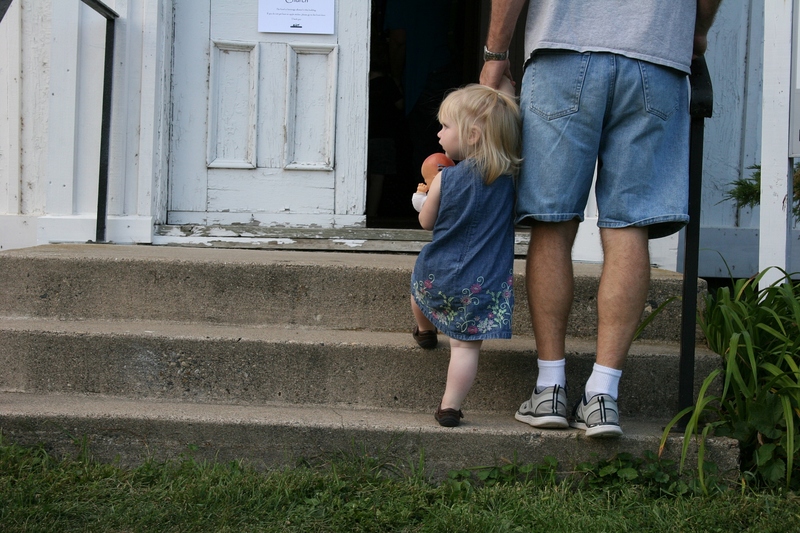 Dad and daughter enter the historic church. A Night at the Museum is definitely a family-oriented event. And, based on my observations, adults and kids attending and participating likewise embrace this style of sharing history. 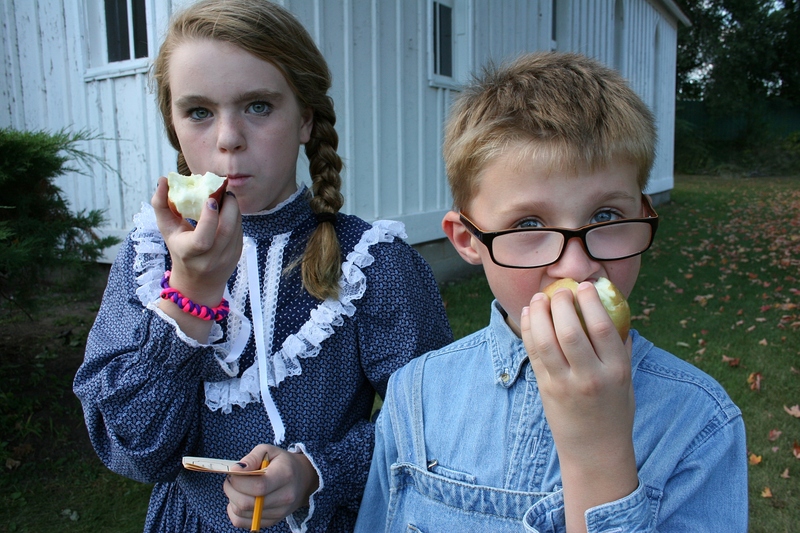 Siblings Kaylee and William (AKA Katie and Jim for the evening) raved about the apples. I’d like to see more of these living history events in my community of Faribault, one of Minnesota’s oldest cities founded in 1852 by fur trader Alexander Faribault. Our historic downtown would provide an ideal stage as would the historic Cathedral of Our Merciful Saviour and so many other aged buildings in and around town. HOW DO YOU BEST learn history? 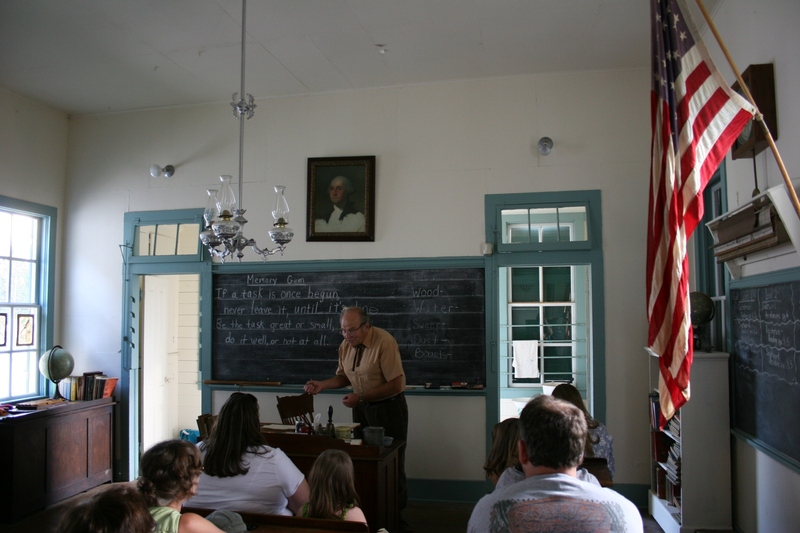 How does your community share its local history? NEVER HAVE I BEEN PART of a community’s visioning process. Until Thursday evening, when eleven of us gathered at the Historic Hutchinson House Bed & Breakfast to discuss Faribault’s strengths, challenges and future under the guidance of hosts Doug and Tami Schluter. 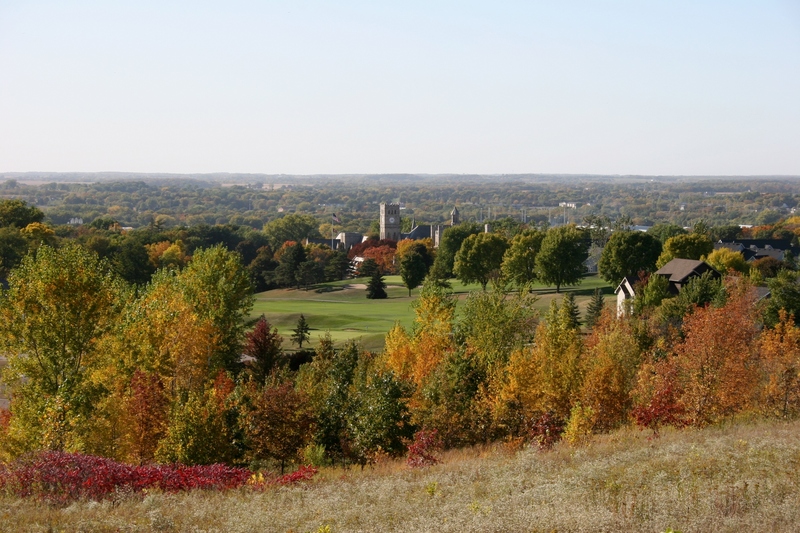 A stunning autumn view of Faribault taken at City View Park show the campus of Shattuck-St. Mary’s School. Minnesota Prairie Roots file photo. For nearly three hours, our baker’s dozen of Baby Boomers focused on our southeastern Minnesota community through this “Meeting in a Box” session. It was a thoughtful process which allowed every single person the opportunity to speak as we rounded the dining room table, one-by-one taking our turns. To have this grassroots chance to voice one’s opinion, without interruption (mostly) and in an informal setting, will provide invaluable information to the City of Faribault, which has launched this seven-month-long community visioning process tagged as Community Vision—Faribault 2040. 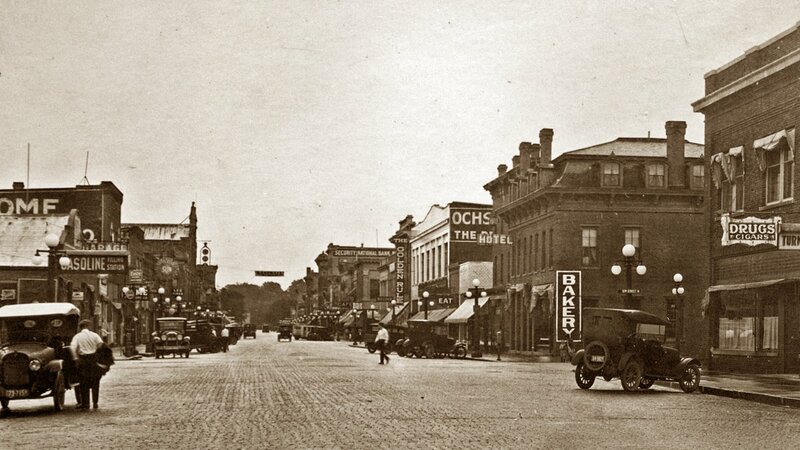 A recent shot of a section of historic downtown Faribault’s Central Avenue. 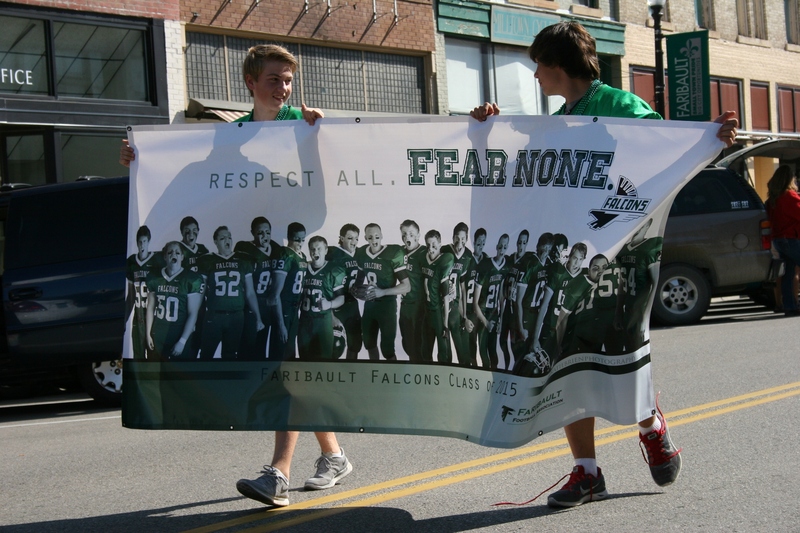 This scene represents to me Faribault’s past, present and future. Projecting 25 years into the future allows our community to be proactive, to plan, to build on strengths, to identify weaknesses, to grow a stronger and better Faribault. I couldn’t help but think, during this brainstorming session, how my second daughter recently reacted to news of a nephew’s upcoming move from Utah to rural Faribault. “It’s Faribault, Mom,” she said, a definite disdain tinging her words. I wondered how many other twenty-somethings share her attitude, how they can’t wait to graduate and move away. Keeping our young people here popped up as a challenge facing Faribault. But I expect residents of almost every city or small town feel the same about the exit of their youth. I left my native southwestern Minnesota prairie at age seventeen. 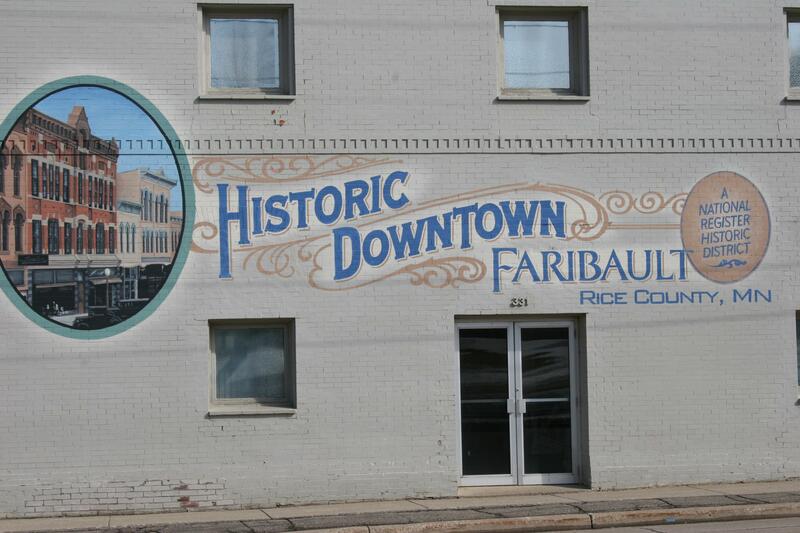 A mural, one of several in the downtown area, promotes historic Faribault. Our community’s rich history and architecture came up repeatedly as strong assets during the “Meeting in a Box” conversation. 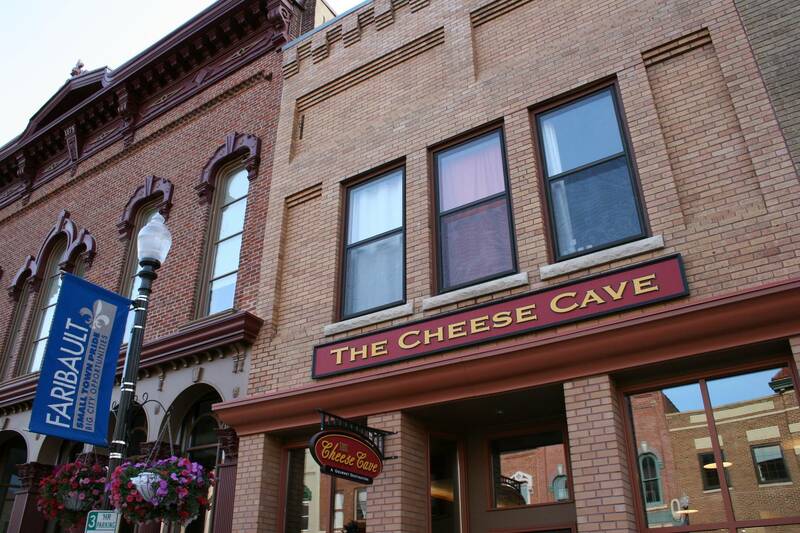 The Cheese Cave is housed in a beautifully-restored building in historic downtown Faribault, site of many old and well-preserved buildings. Minnesota Prairie Roots file photo. We could jot down three answers before circling the table and sharing. 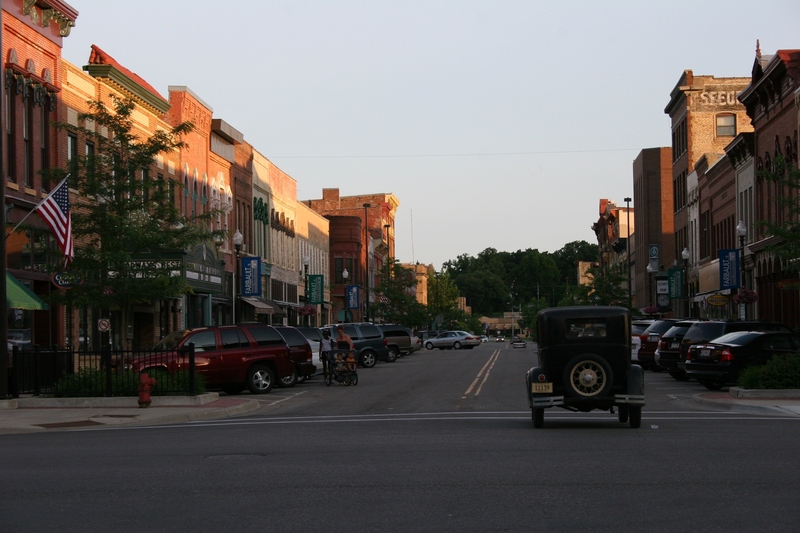 Once all answers were listed, we voted these as the top five reason’s Faribault is great: variety of educational choices, downtown architecture and rich history, efforts to preserve the past, good mix of businesses and people who care about one another. Then it was on to the next question, which proved much more difficult: When you look 25 years into Faribault’s future, what are the most important community strengths we should build upon as we plan for Faribault’s future? After significant effort to even understand the question, we responded, then voted for our top five most important community strengths: educational opportunities, grow industries, preserve small town feel, tourism opportunities and preserving historical buildings and history. Finally, the last question asked us to identify Faribault’s most pressing challenges as we plan for the future. 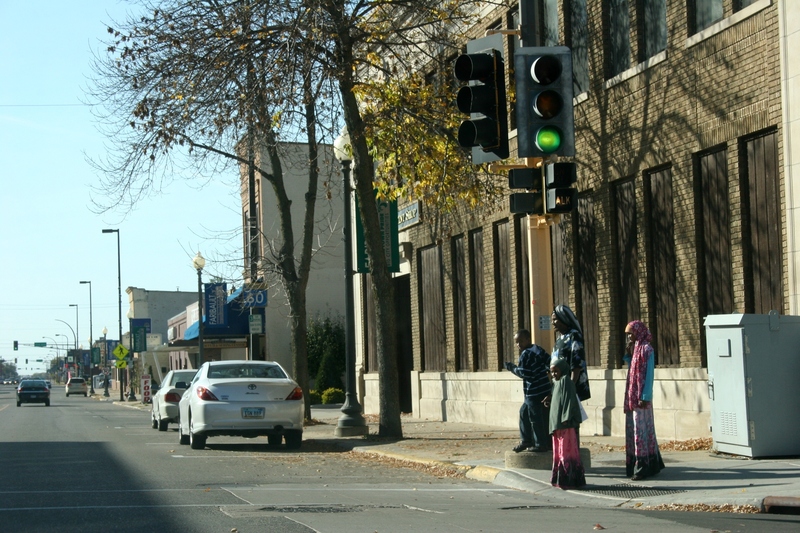 A Somali family waits to cross a street in downtown Faribault. Diversity-related issues rated high in conversation. Minnesota Prairie Roots file photo 2010. Those responses flowed fast and easy with the following marked as Faribault’s top challenges: housing code enforcement, crime (specifically domestic violence, drugs and DWIs identified), diversity related issues, city/county/citizen leadership, community planning and poor community pride. Not much revealed at this “Meeting in a Box” session surprised me. Yet, it’s good to get our thoughts out there so city leaders are aware of Average Joe or Jane Resident’s concerns. 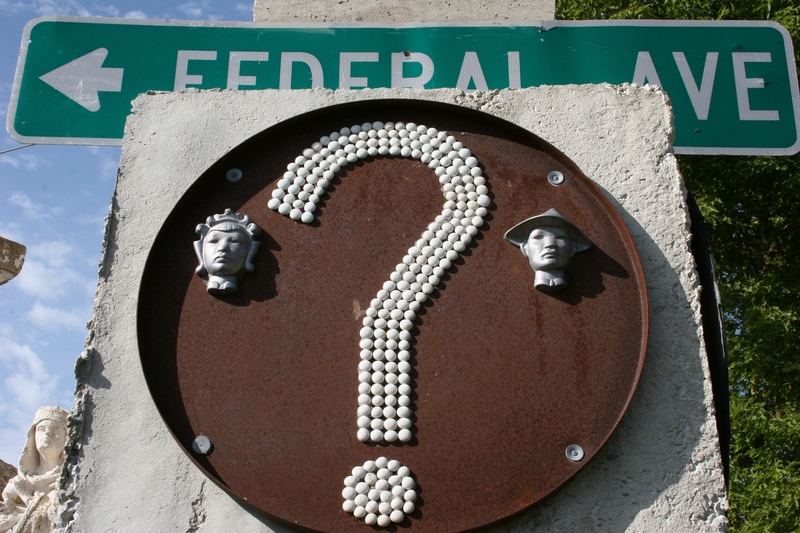 Our long lists of answers—all of them, not just the top five—will be forwarded to city officials. That’s reaffirming, to know that every single response will be passed along. 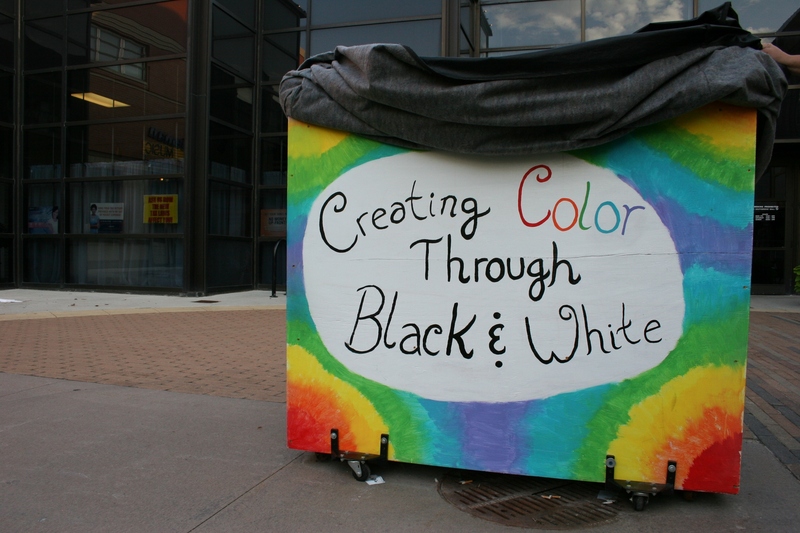 This week, from 7 – 9 p.m. Thursday, October 2, the Schluters are hosting another “Meeting in a Box.” They’re looking for participants. So, if you want a voice in the conversation about Faribault, contact them. These sessions are being held through-out the community as the second step in the visioning process. Focus groups and community forums will follow. For this process to truly reflect Faribault, though, more than just grey-haired Caucasian Baby Boomers will need to provide input. Opinions from all races and ages are needed. Young people are our future. They will live the longest with the decisions made today. Unless they leave Faribault. Like my two daughters and son. THEY THREW A PARADE for me in Faribault. Not really. But my friend Beth Ann and I decided that, yes, the Faribault High School homecoming parade Friday afternoon was also my birthday parade. We had just finished to-die-for individual pizzas—mine pear paired with award-winning blue cheese made in Faribault and Beth Ann’s a Caprese with fresh basil pesto, mozzarella and tomatoes—at The Cheese Cave and toured the Paradise Center for the Arts when we stepped outside to find a throng of young people. I deduced that it must be homecoming. 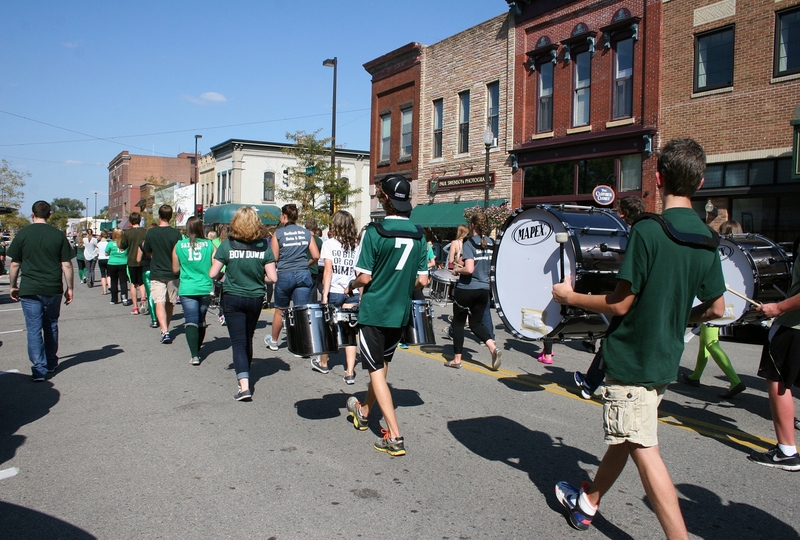 Every parade needs a band. 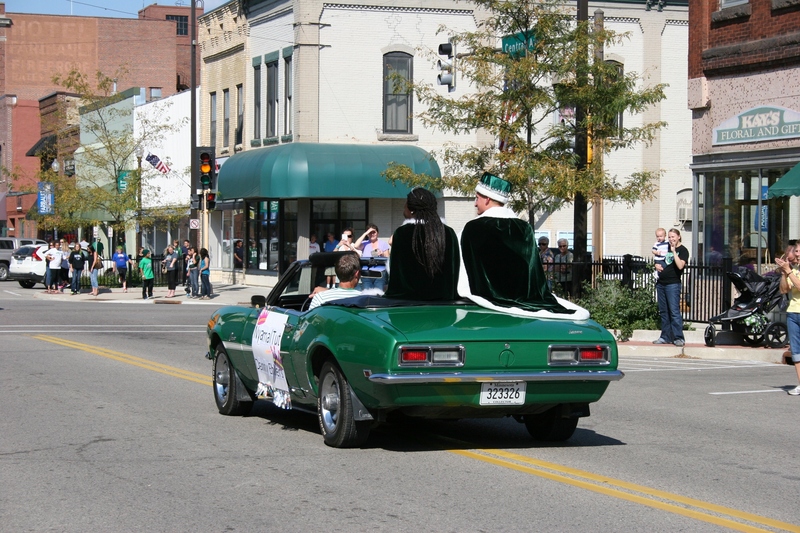 Faribault High School homecoming queen, Nyamal Tut, and king, Danny Ehlers. Even the convertible was in the school color. and lots of raucous FHS students along Central Avenue. 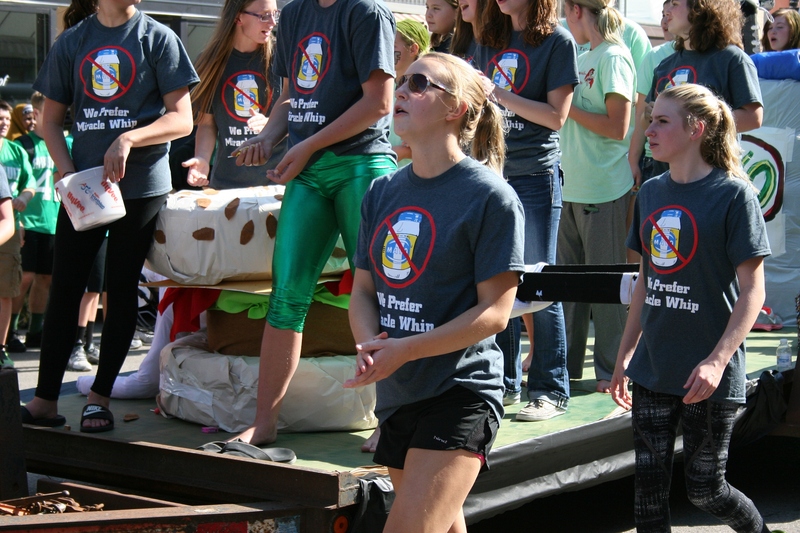 My favorite float featured the theme of preferring Miracle Whip over Mayo, as in the Faribault Falcon’s opponent, Rochester Mayo High School. 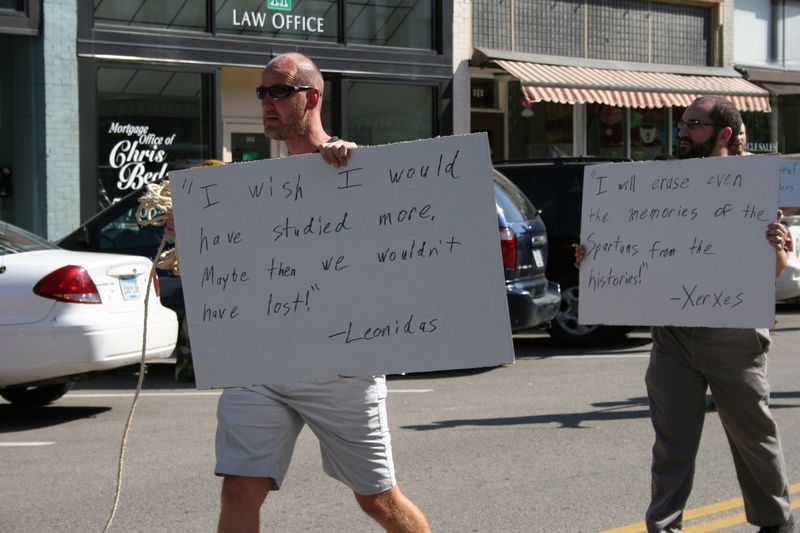 We were in on this parade whether we wanted to be or not and we wanted to be. How can you resist the youthful excitement of teens on an autumn day as perfect as they come in Minnesota? Humor at the expense of the Mayo Spartans. 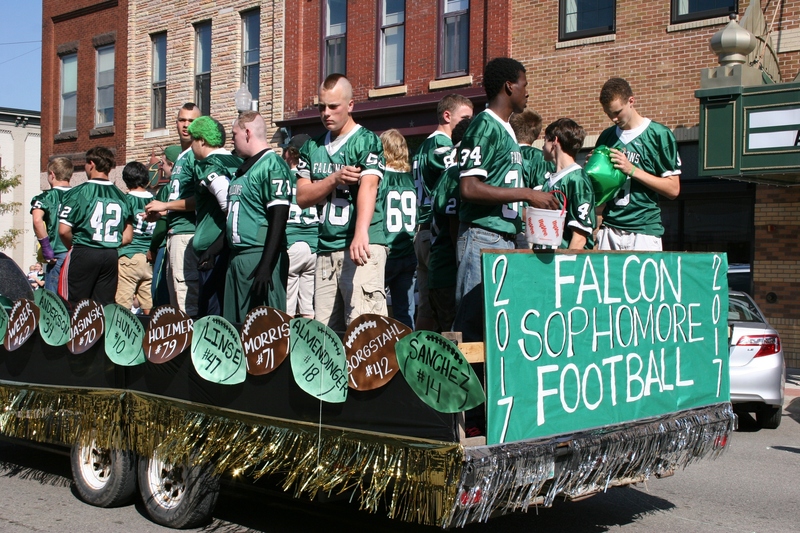 The Falcons beat the Spartans 23 – 21 in the homecoming football game. 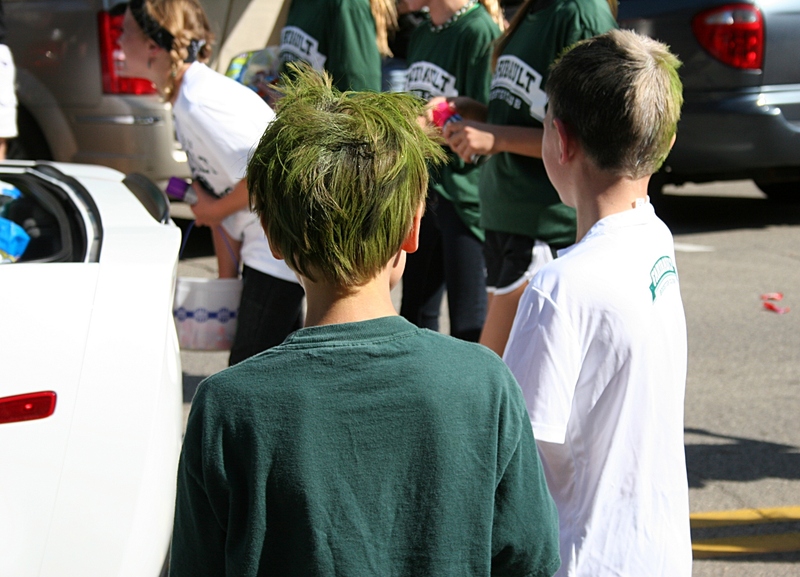 Cheers and noise and drum beats and hair colored green and humor and throbbing energy and candy tossed onto pavement. 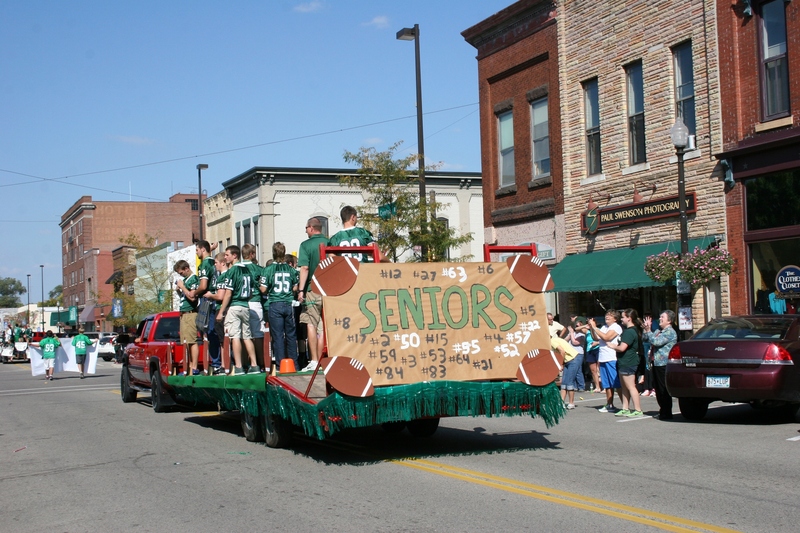 A homecoming parade. For a moment or ten, I wished I was sixteen again. 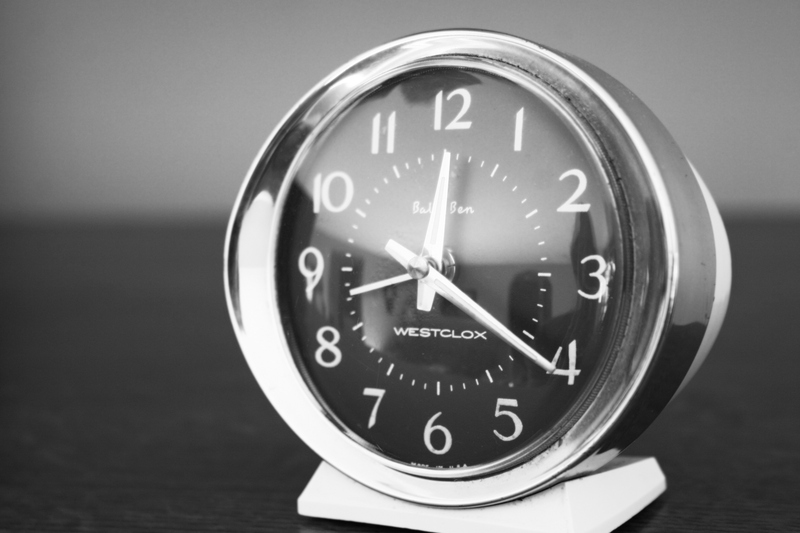 I recently started collecting alarm clocks and now have four, three Westclox and one General Electric. NEVER HAVE I BEEN MORE COGNIZANT of the passage of time than during this past year. I can’t pinpoint a precise reason for this deep sense of time fleeting. Rather, a combination of life events has spawned this feeling. A year ago, my eldest married. Although she graduated and left home 10 years ago and her sister two years later, only two years have passed since my youngest started college. He’s in his third year now, his second in Boston. He spent the summer there, too, working. I haven’t seen him in three months, won’t see him for another three. I miss him and the girls—their closeness, the hugs, the conversation, the everything (almost) that comes with parenting children you love beyond words. Too many days I wish only to turn back the moments. I wish again to be that young mom, with issues no bigger than the occasional two-year-old’s tantrum or the snarky teen or a kid I can’t rouse from bed or the picky eater. But when you’re handling such challenges, they seem ominous and big and looming. Ridiculous. Granted, I am, as the old adage says, “older and wiser.” But such wisdom comes via life experiences that color hair gray. Or maybe not solely. Time does that, too. I am now the daughter with a mother in a nursing home, my father in his grave for nearly a dozen years. A friend noted the other day that he never saw his parents grow old to the age of needing his care. And I wondered if that was good or bad and then I didn’t want to think about it anymore. I am now so close to age sixty that I feel my fingers reflexively curving around the numbers. Which brings me to today, my birthday. 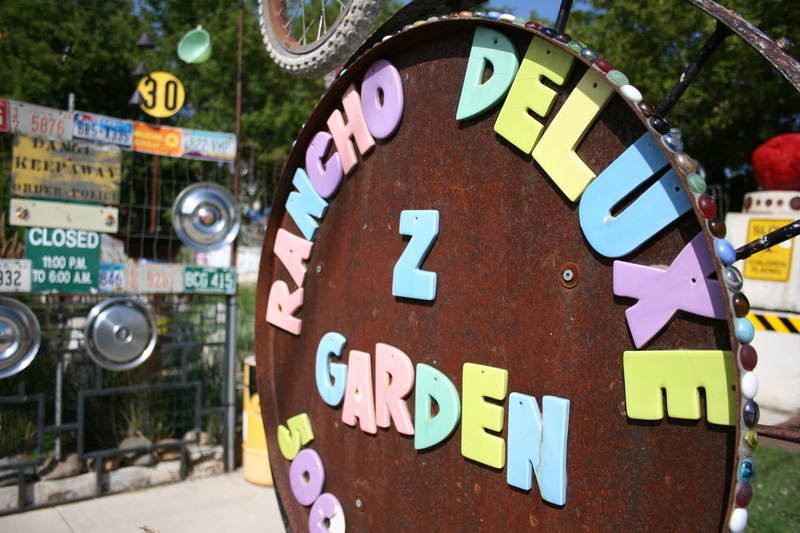 A PRECISE WORD EDLUDES me to describe the Rancho Deluxe Z Garden in Mason City, Iowa. 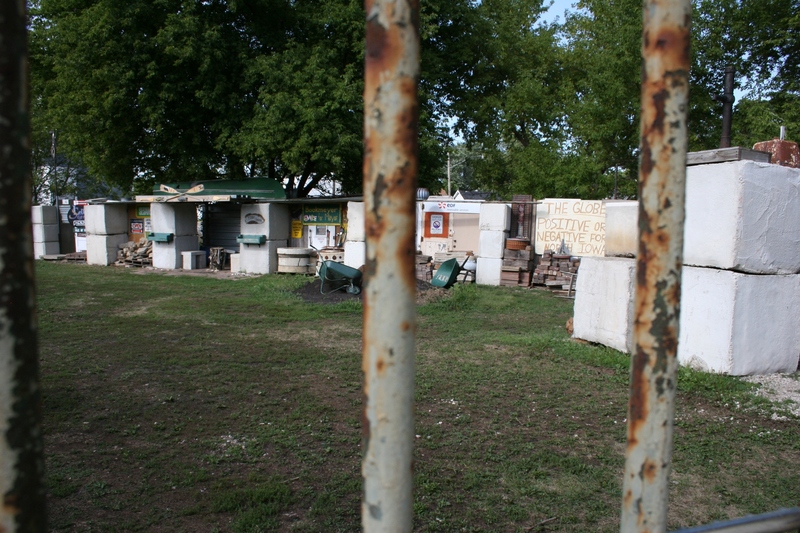 A sign welcomes visitors to this unofficial, privately-owned Mason City sculpture garden. Rather, I must choose a list of words for this half-acre garden created by local Max Weaver: quirky, odd, unique, creative, unbelievable. And, yes, even a bit weird. While touring here, you certainly will ask yourself about the meaning of many objects and displays. An outside the fence view. 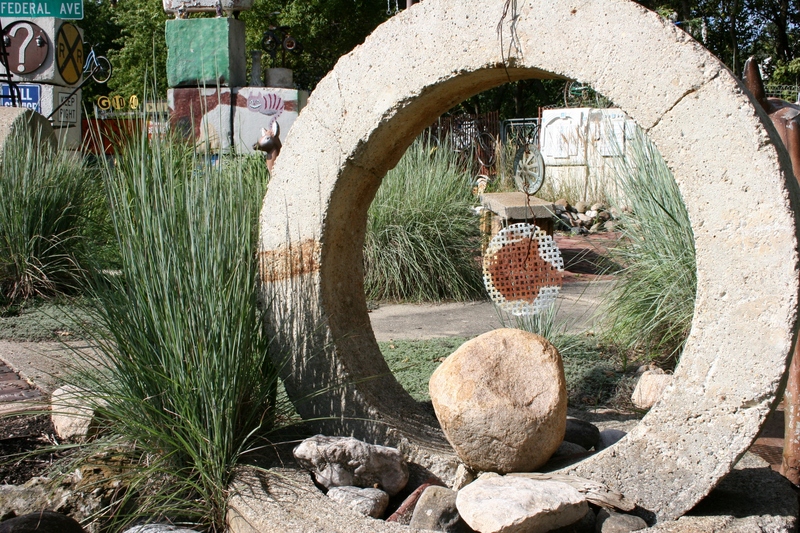 I really liked this circular garden art placed next to ornamental grass. 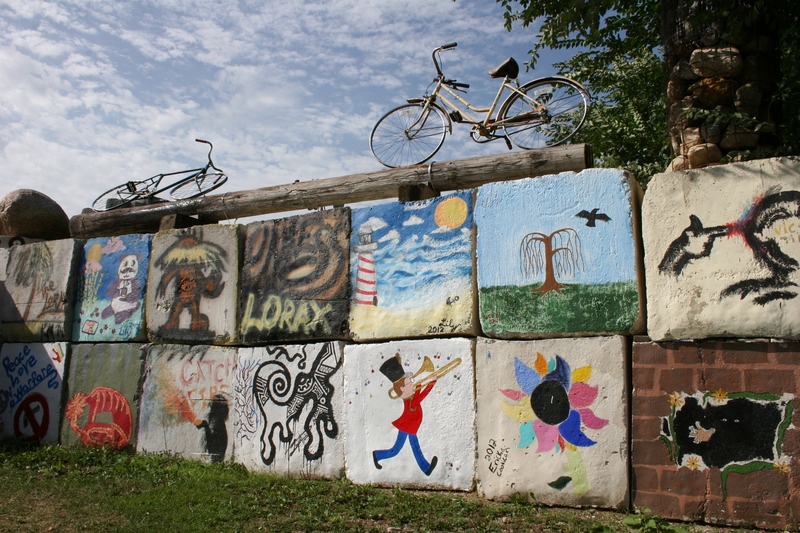 I simply love this repurposing of 4,000 pound cement blocks as canvas for art. Love this message in the maze of blocks. 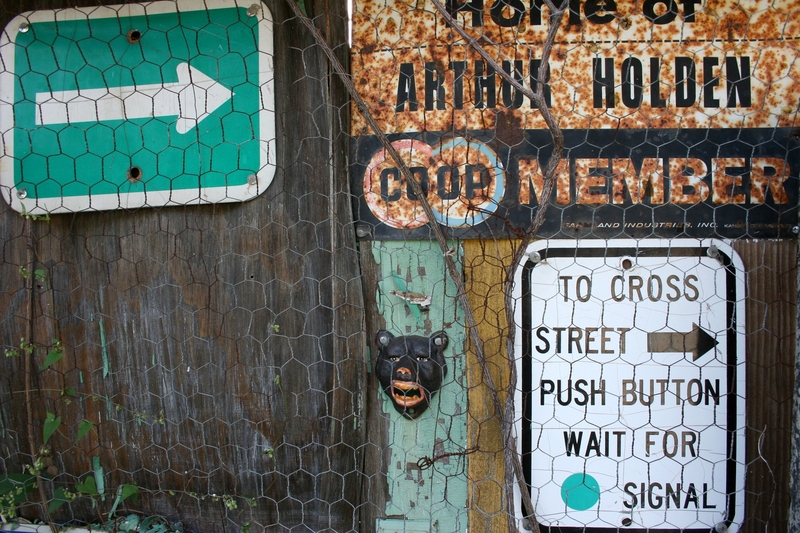 Even old signage proves artful. 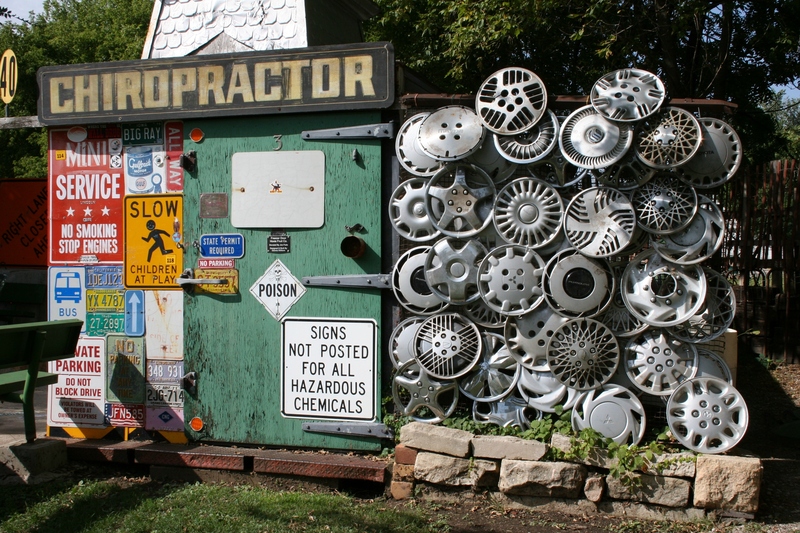 One of my favorite sculptures features wheel covers. The garden even includes a veterans’ memorial. More projects and/or space for future expansion spotted through a barred barrier on the property. FYI: Click here to read my first post about Rancho Deluxe Z Garden. Please check back next week for more stories from my visit to Mason City. 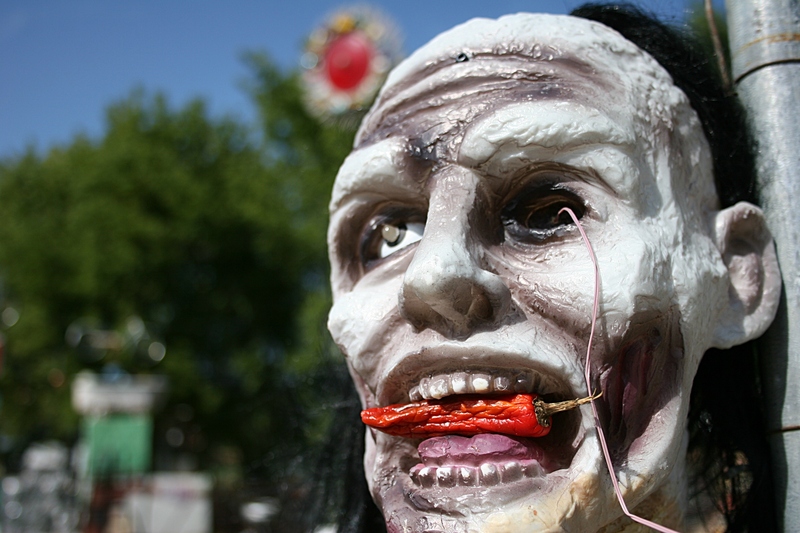 YOU LIKELY WILL NOT FIND this Mason City attraction listed on any official tourism website. 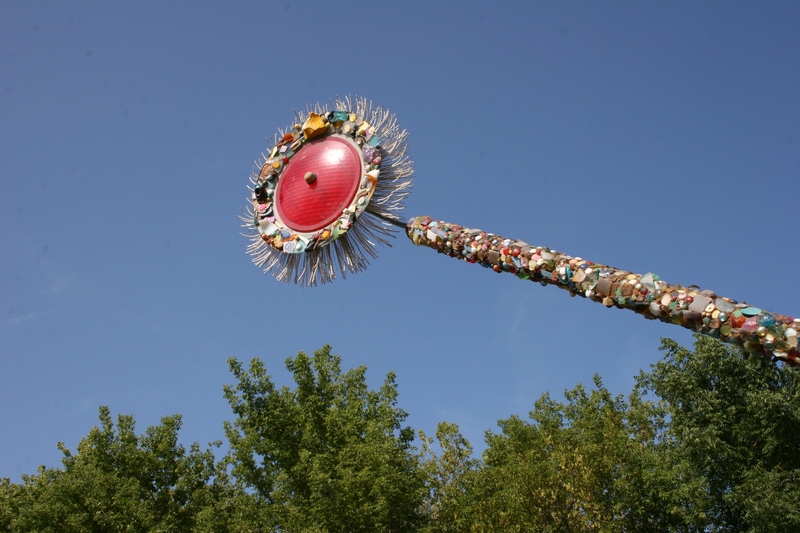 The official sign marking this unofficial sculpture park in Mason City. 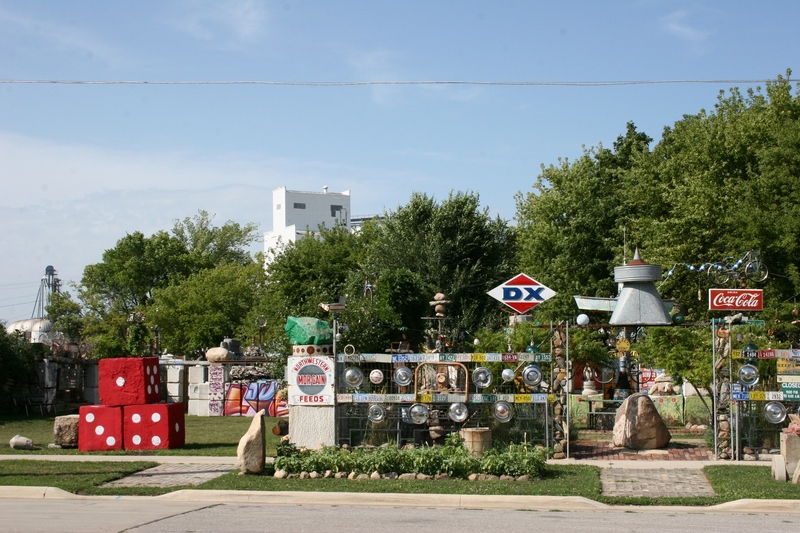 But Rancho Deluxe Z Garden, a quirky sculpture garden created on a half-acre of land in this northeastern Iowa community, is precisely the type of homespun arts spot that draws my interest. An overview upon arriving at Rancho Deluxe Z Garden. 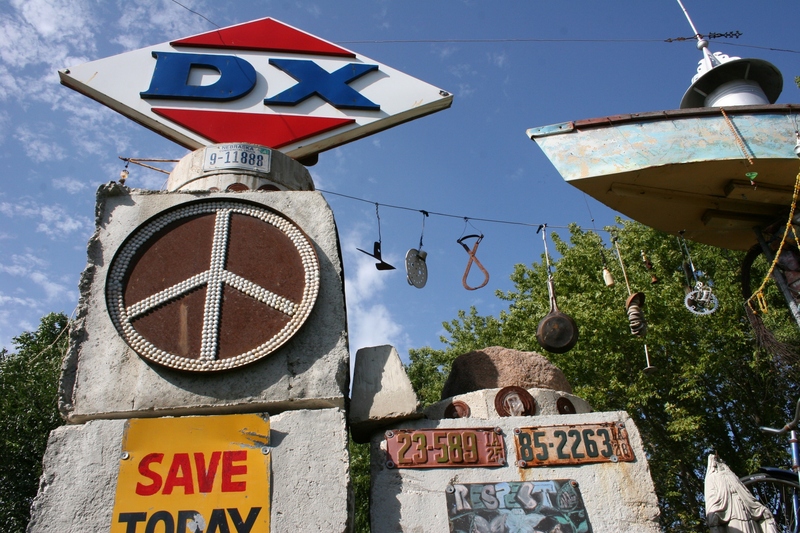 If not for Mason City resident, blogger and friend, Beth Ann Chiles, though, I likely never would have visited this community, thus missing out on Max Weaver’s creative oddity located at 500 Second Street Northeast. Beth Ann knows me well enough to know I would want to visit the Rancho while visiting her. The freaky portrait I captured. So off we drove, aiming for this sculpture garden at the end of a dead end street on a hot and humid Sunday afternoon in late August. We weren’t the only ones there. A photographer was doing a senior photo shoot in a spot apparently popular for such portraits. The garden features an abundance of bikes. The other side of the suspended bike. 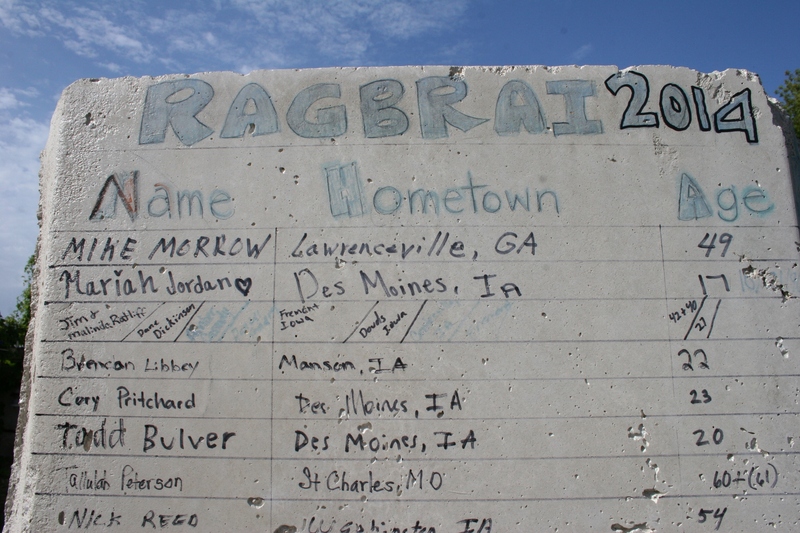 Signatures of Ragbrai 2014 participants who stopped here. 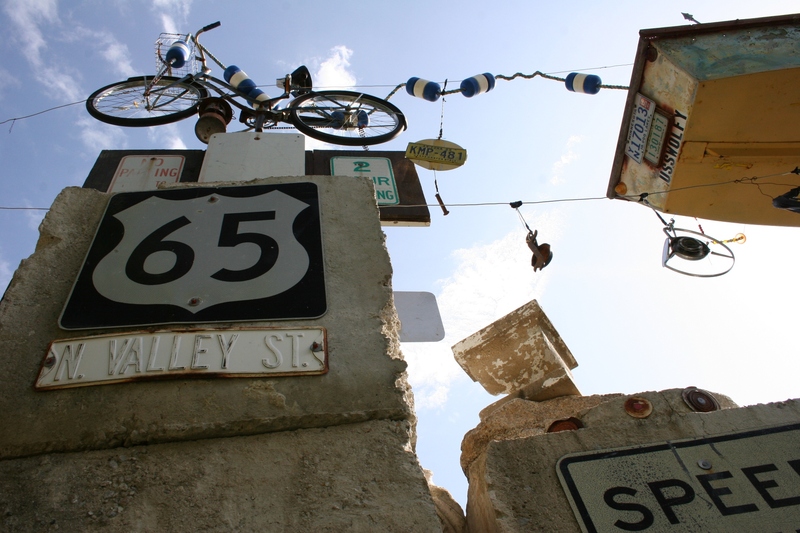 And this summer, participants in Iowa’s Ragbrai, an annual bike ride across the state, toured the Rancho, a stop documented in signatures upon a cement block. 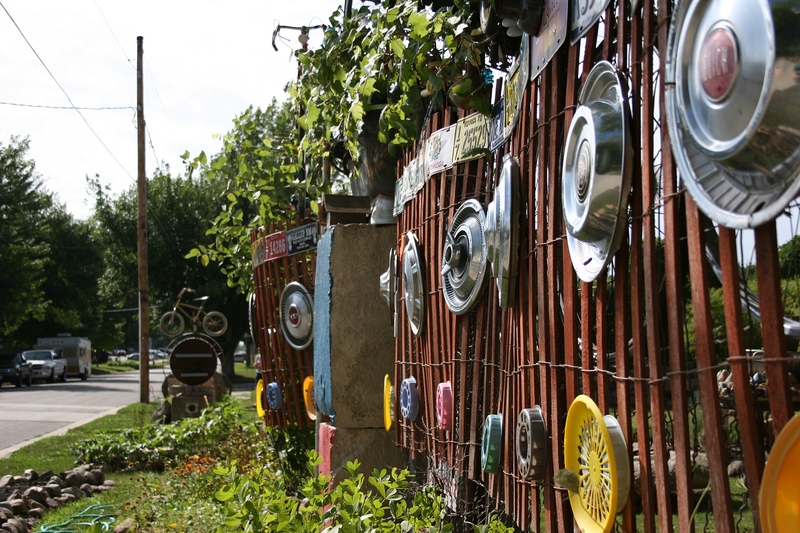 The garden features bikes suspended from trees, fences and elsewhere, incorporated as works of art, making this Ragbrai visit especially appropriate. Randy found his way inside the castle. Beth Ann and I, cameras in hand, meandered through the garden while my husband, Randy, clipped along. The Rancho calls for a slow study and multiple times walking through the garden to take in every detail. I expect I missed much, even at my snail’s pace. And, noted, Beth Ann, the garden is ever evolving. 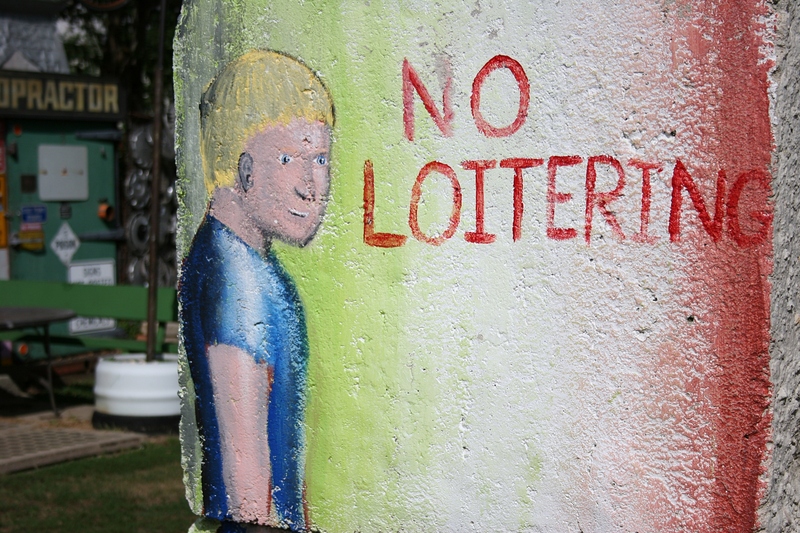 Do loiter here. 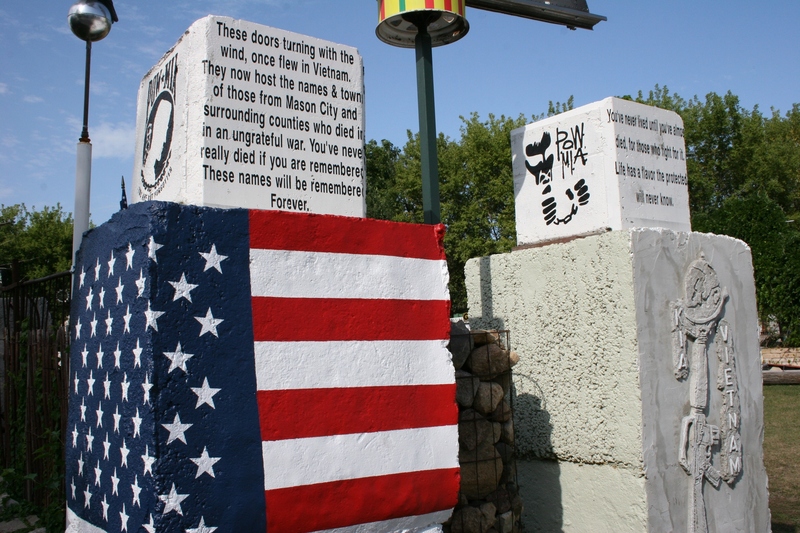 Especially take time to look at the many 3-foot square painted cement blocks weighing 4,000 pounds. 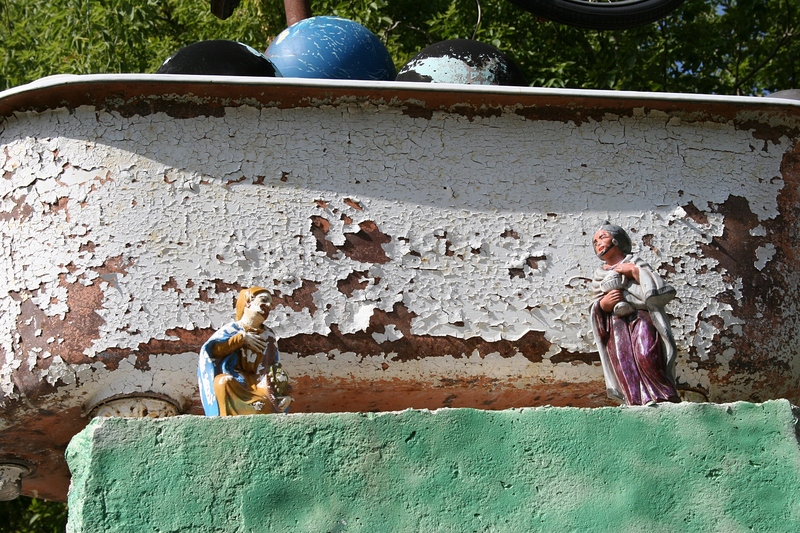 From signs to hub caps, bikes, dolls, license plates, rocks, statues, wheels, painted cement blocks and more, this garden presents an eclectic mix of stuff artfully placed on this plot of land. 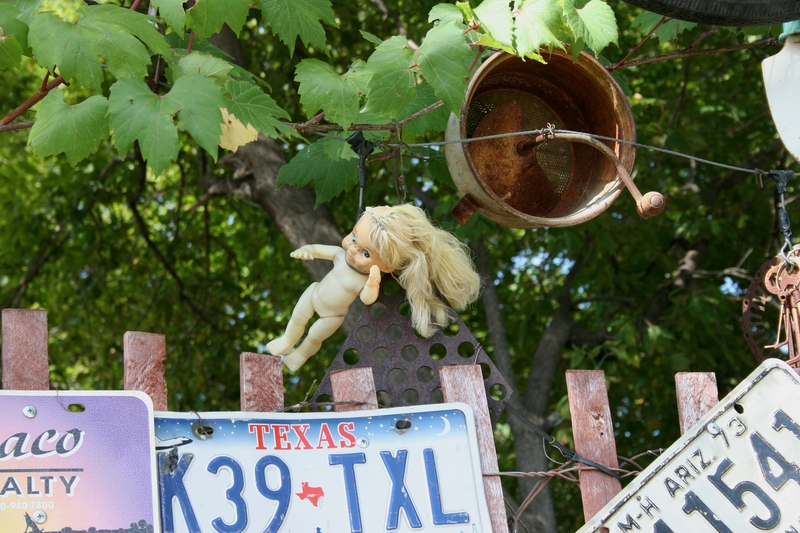 I’m always a little creeped by misplaced dolls. 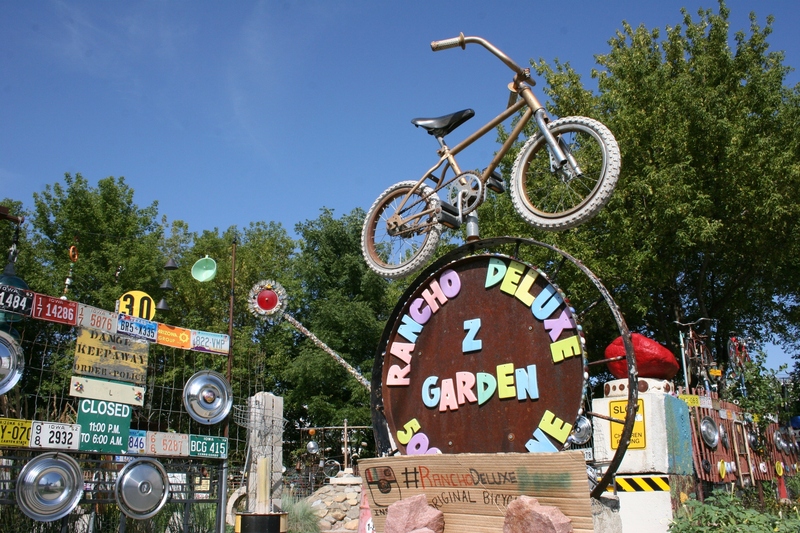 You just have to see Rancho Deluxe Z Garden to believe this almost indescribable place. 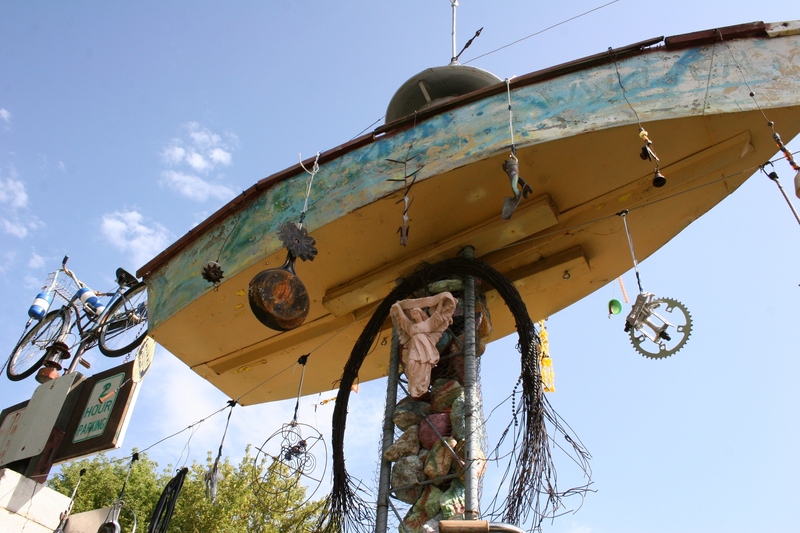 If you appreciate odd and quirky and art outside the box, then head for Mason City and Max Weaver’s unique sculpture garden. Love this flower arcing above the garden. 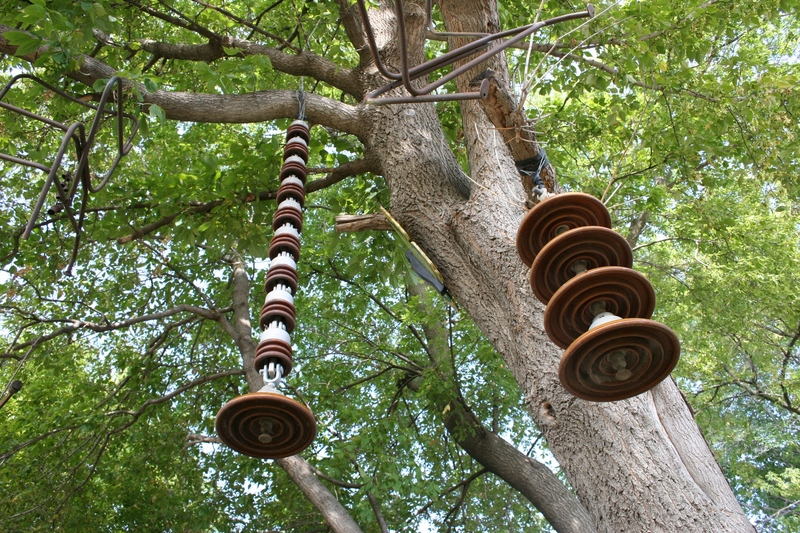 More stuff suspended from trees. 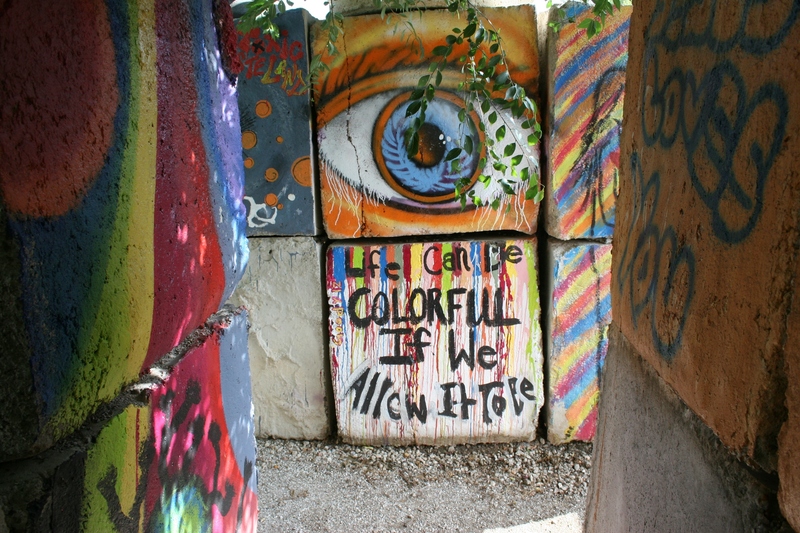 Love the vibrant colors and the art painted on a cement block. 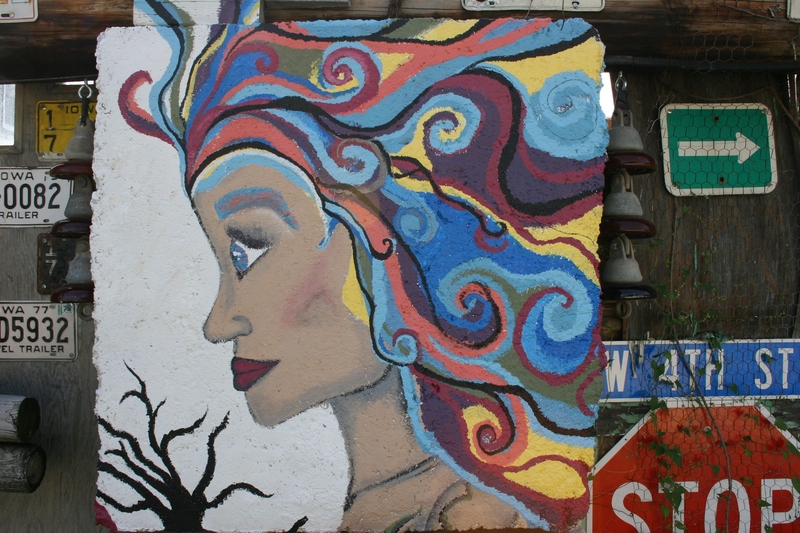 As I understand, the painted art has been created by many local artists. 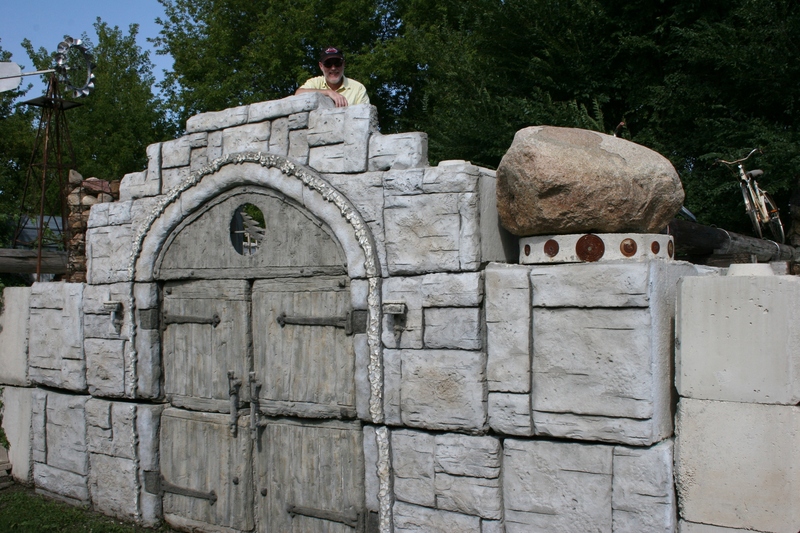 FYI: Check back tomorrow for more photos from this sculpture garden. 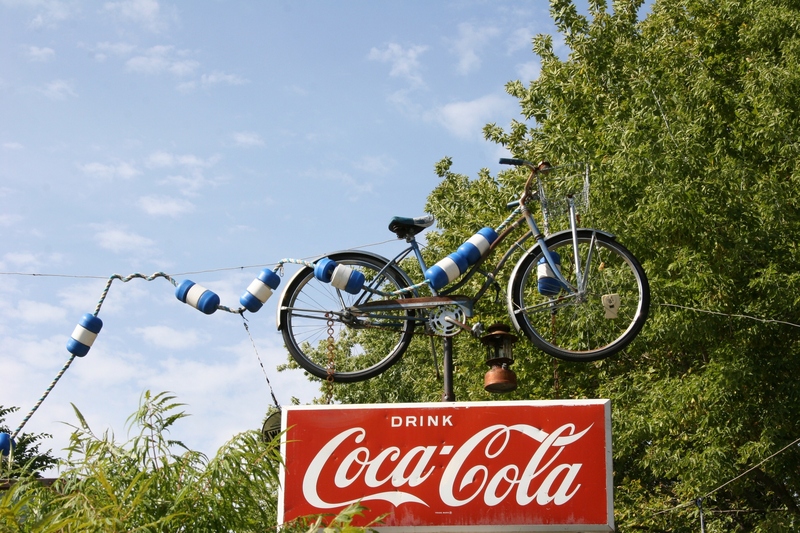 If you like quirky places, consider also touring the “antique theme park” at Hot Sam’s Antiques, rural Lakeville, Minnesota. Click here to read about my visit there two years ago. IOWA. We Minnesotans joke about our neighbor to the south. Well, my fellow Minnesotans and anyone who has ever shunned Iowa, there are many reasons to visit this Midwestern state. Iowa is about much more than the slogan, “Fields of Opportunities,” bannered on a Welcome to Iowa sign as you cross the border aiming south. You’ll see lots of farms as you drive through Iowa, including this one off Interstate 35 just across the Minnesota border. Yes, you will see an abundance of endless fields and lots of barns. Northeastern Iowa is even designated a Silos & Smokestacks National Heritage Area celebrating agriculture. But you’ll also discover charming river towns and other interesting attractions, too. 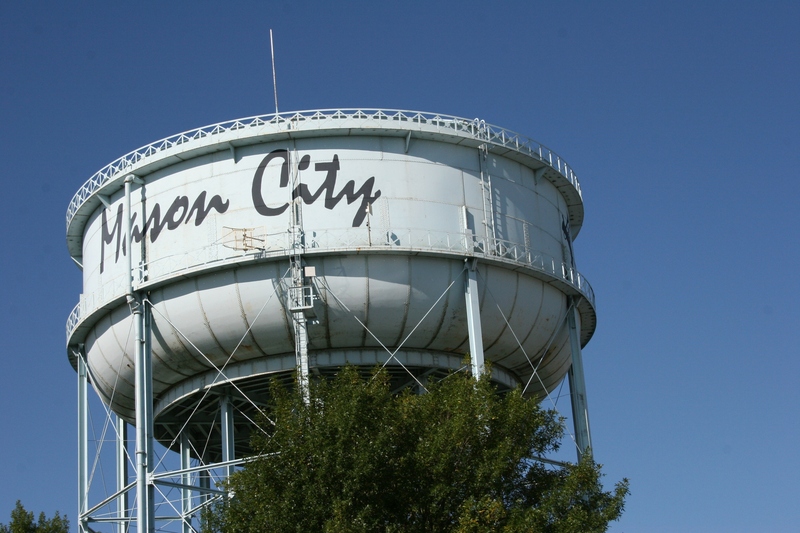 Welcome to Mason City, a community of some 28,000 in northeastern Iowa. We’ll start our journey off Interstate 35 just across the border in Mason City, home of my friend, Beth Ann Chiles, who blogs at It’s Just Life. Beth Ann welcomed my husband and me into her northeastern Iowa community, touring us around town on a hot and steamy August Sunday afternoon. Yes, we were practically dripping sweat. But, it was a great tour and a wonderful day and overnight spent with a friend whom I cherish. 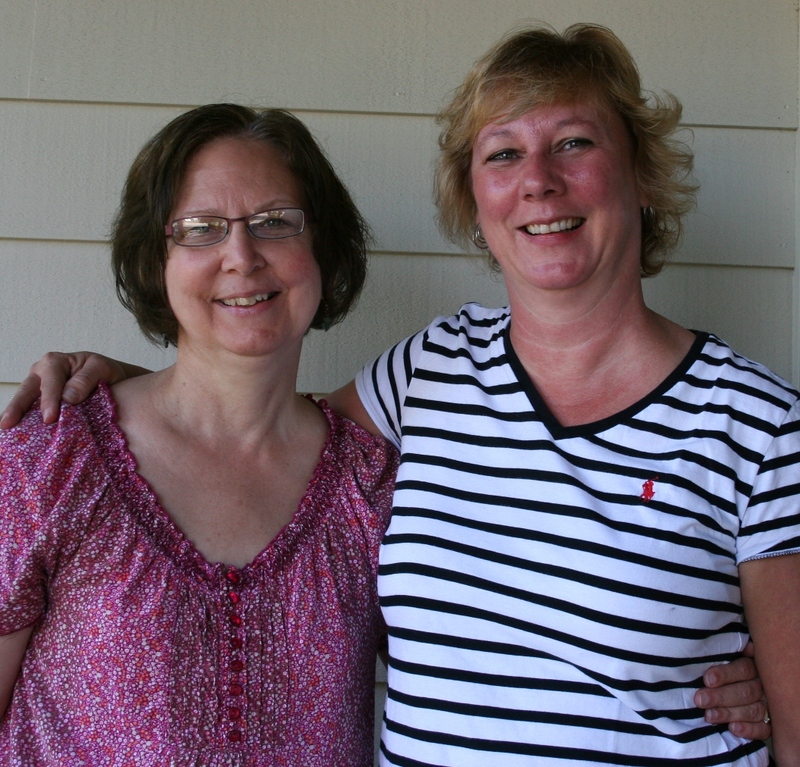 Friend and blogger Beth Ann, right, was our personal tour guide in Mason City. 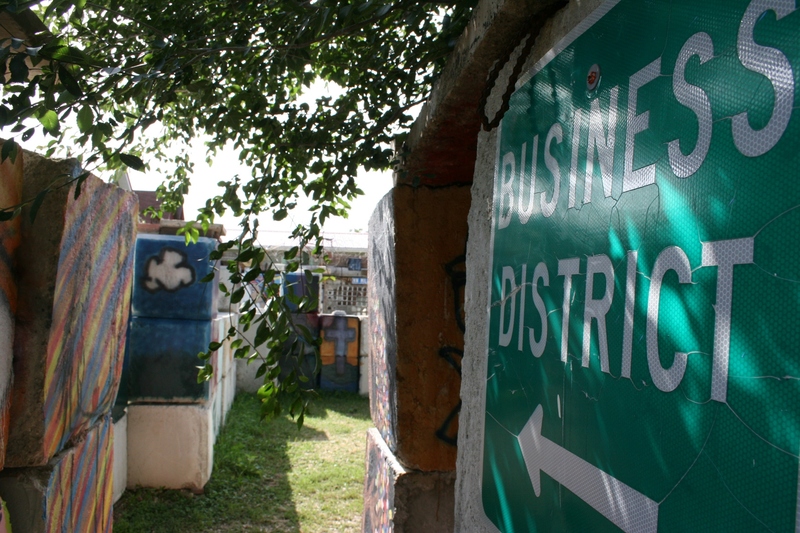 This sign does not point to downtown Mason City, but rather to a quirky and interesting attraction. Any guesses as to what this might be? Photographed in the heart of downtown Mason City. 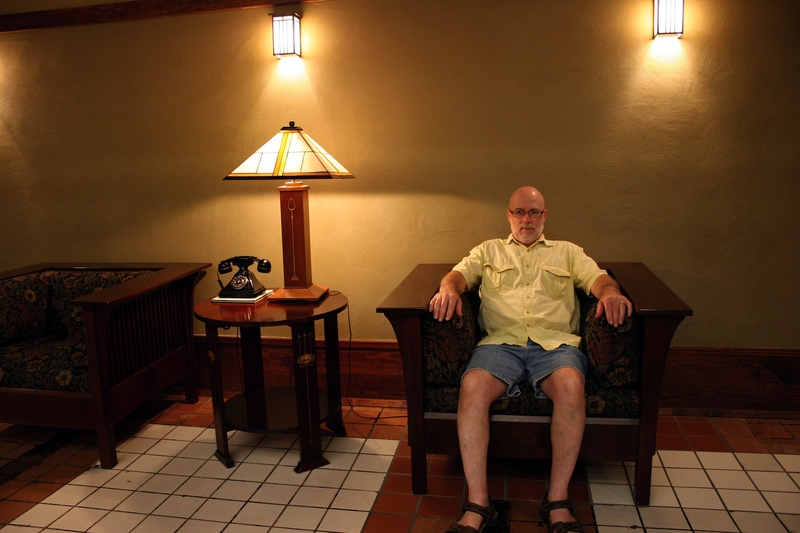 My husband kicks back in an historic building that draws lots of architectural interest. 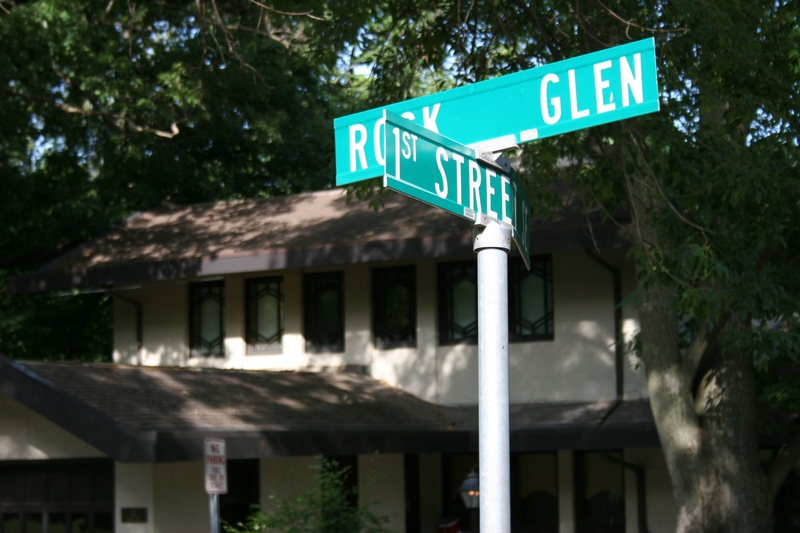 Not just any old street corner in any old neighborhood. Check back for a closer look at these attractions as we tour Mason City before journeying toward the eastern border of Iowa.